A special thank you to Metro Parks Tacoma for all the time, energy and creativity that went into hosting the 2015 WRPA Annual Conference. Thank you for a wonderful conference! WRPA's Aquatics Network two-day Conference will be an amazing opportunity that provides training locally and inexpensively to meet the needs of facilities with limited training budgets. Learn from those in the biz — it's more than fun and games and getting a tan! This program is designed specifically for aquatic professionals at all levels including Head Lifeguards, Aquatic Directors, Managers, Supervisors and Coordinators. This is your chance to gain skills and knowledge about Facility operations and the relevance of aquatic recreation. Learn how to overcome the challenges of training staff and how to have a stronger customer service experience. Hosted at Great Wolf Lodge, an exciting resort that features a complex water park including six waterslides, an extreme tube ride, three activity pools, an indoor/outdoor hot tub and an interactive treehouse water fort. Early Bird prices are now available, so don't miss your chance to join your aquatic colleagues at this incredible conference. Join WRPA for a night of fun and networking while enjoying a great game! WRPA has partnered with the Mariners and Sounders to offer discounted tickets to each game with a portion of every ticket sold benefiting WRPA. This offer is open to WRPA members and non-members. We encourage you to invite staff in your department, family and friends, or anyone else who might enjoy the game. The more tickets we sell, the more it benefits WRPA! 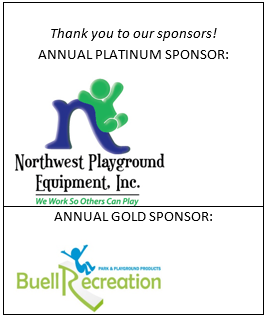 The Washington Recreation & Park Association (WRPA) celebrates people, parks and programs with an award program honoring individuals and organizations for their contributions to the field of parks and recreation in Washington State. The 2015 award recipients were honored at our Annual Conference & Trade Show on Thursday, April 30th at the Greater Tacoma Convention Center. From the snow-capped peak of Mount Rainier to the roaring waters of the Spokane River to the lush canopies of the Hoh Rain Forest, we Washingtonians have incredible outdoor experiences right at our doorsteps. This beautiful natural setting brings us many economic and educational benefits. It's also the underpinning of a unique opportunity to support Washington's kids and economy that has brought Democrats and Republicans together in Olympia. Artificial turf fields, cushioned with recycled crushed tires and increasingly in demand for U.S. athletic complexes, are getting some serious pushback. Increasingly, many places nationwide are debating costly plans to build new, or refurbish old, artificial turf fields, and sports enthusiasts who love the vivid-green fields for their durability and easy maintenance are bracing for new opposition from parents of budding athletes about the safety of crumb rubber pellets.